DAVID KRIER from the Valley Stewardship Network presented the results of the recently completed surface water quality monitoring initiative to farmers from the Tainter Creek Watershed. POSTED January 30, 2019 12:00 p.m.
CRAWFORD AND VERNON COUNTIES - In an effort to switch things up and reach out to farmers in the Crawford County part of the watershed, the Tainter Creek Watershed Council held their January meeting in Gays Mills. At least one new Crawford County farmer attended the meeting, as well as Ellen Brooks with the Crawford Stewardship Project, and Dave Troester and Travis Bunting from the Crawford County Land Conservation Department. Subjects addressed by the group at their Wednesday, Jan. 9 meeting include a surface water quality report by Dave Krier of Valley Stewardship Network (VSN) and brainstorming what kind of farmer education events the group is interested in sponsoring in 2019 with their DATCP Producer-Led Watershed Council grant funds. The 2018 median yearly phosphorous measurements at 12 sites within the Tainter Creek Watershed were all below the 0.075 mg/L threshold that the Wisconsin DNR has set in NR 102.06 to protect fish and aquatic life in streams. Phosphorous measurements can vary significantly based on rainfall events, raising the phosphorous levels in the stream. VSN’s testing protocol is to sample at the same time of the month regardless of precipitation so as to not skew the results either direction. The 90 percent confidence level of median phosphorous measurements, using DNR-approved statistical calculations of a minimum of six data points in a season, showed one site with an exceedance in 2018. The streams in Tainter Creek watershed were generally favorable compared to other streams in the Kickapoo Valley tested since 2015. Three sites in Tainter Creek watershed had at least three years of phosphorous measurements, and showed declining or flat median phosphorous levels from 2016-2018. One site had phosphorous data available from 2005 and 2006 as well as 2016-2018, and it showed a slight increase in phosphorous levels, though the earlier data also included winter measurements that lowered the earlier median slightly. VSN plans to continue measuring phosphorous at these sites in 2019, and add several other sites to improve the group’s understanding of several feeder streams. 2018 was the first year of measuring nitrogen in Tainter Creek, so there are only two or three data points per site. VSN plans to eliminate measuring for ammonia and organic nitrogen, as the 2018 results show very small amounts compared to total nitrogen (nitrite plus nitrate) in order to save money. Data showed a small rise in total nitrogen from May through August, and a higher level of nitrogen further up in the watershed. They did find a site they are currently testing that also had nitrogen measurements from 2005/2006 and 2012, and this data shows an increase in total nitrogen over the 13-year period 2005-2018. It is very important to note that only two data points were sampled in 2018, so it is too early to draw a significant conclusion. The plan is to continue testing for nitrogen in 2019 to improve understanding of nitrogen levels in the watershed. Dissolved oxygen in the watershed has been very good. One site has had continuous data monitoring since 2010, with all data above the Wisconsin DNR threshold of 7 mg/L for spawning fish. With this measurement of surface water quality, a higher number is a better result. Macroinvertebrate studies, which measure the number of aquatic insects in a sample of water, are an excellent barometer of water quality, providing a good representation of the overall water quality year-round. Thirteen different stream studies since 1979 in the Tainter Creek Watershed have shown at least a ‘good’ result using the Hilsenhoff Biotic Index. The average of the results has been ‘very good,’ with the last study being in 2016, which took place right after a significant flood event. Additional macroinvertebrate work is planned in the Tainter Creek watershed in 2019, working with the Wisconsin DNR. After hearing the report on the surface water quality of the watershed, the group moved on to review the 2019 Producer-Led Watershed Council grant funds. The group was funded the maximum amount of $40,000 for the second year in a row. $900 – EVAAL watershed modeling, maps, data and presentation; and marketing brochures, handouts and surveys. The group agreed that the committee assignments from 2018 would go forward into 2019. In particular, the Events Committee was urged to meet in February and come to the next meeting of the group on Monday, March 4, 7:30 p.m., at the Town of Franklin in Liberty Pole, with recommendations about education topics and presenters. 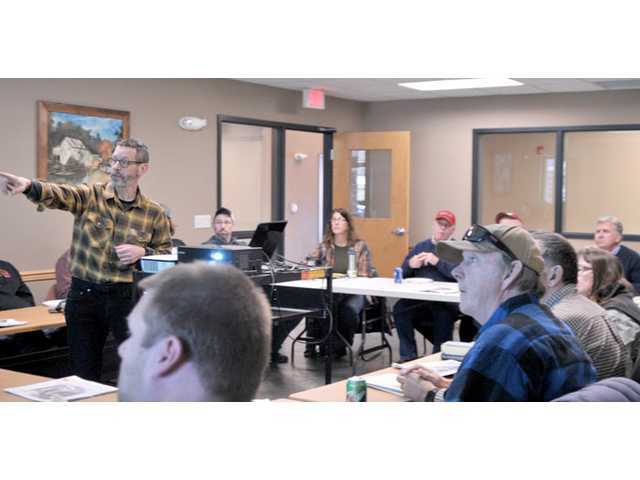 The group will once again collaborate with Trout Unlimited and other partners on a streamside education event in the watershed on the State Free Fishing Day in June. The group is seeking a landowner in the watershed with creek access to host the event.